CSI Fiberlink® 3370 - Fiber Group Inc.
Category: CSI (Communications Specialties Inc. The Fiberlink 3370 Series allows you to transmit 3G, HD or SD-SDI as per SMPTE 424M-2006, 292 and 259 with the ability to transmit 10/100 Base-T Ethernet and two channels of RS-Type data over one single mode fiber. 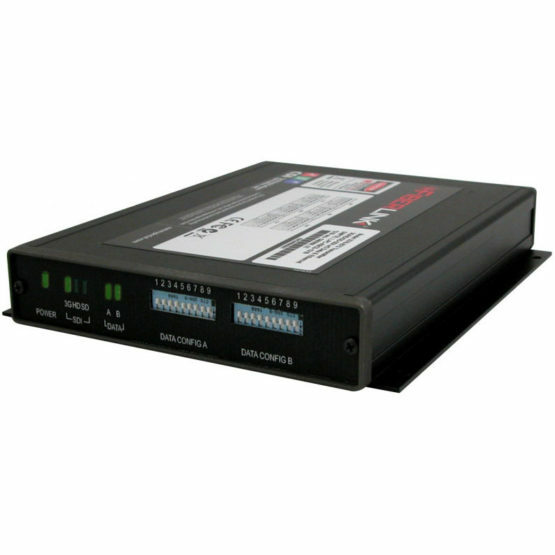 All data channels are available simultaneously and convenient switches on the 3370 Series transmitter allow the operator to configure each of the two pairs of data independently. Data signals are not required to operate the Fiberlink 3370 link and it can be used as a stand-alone 3G/HD/SD-SDI optical link. Previously serialized audio that is present SDI stream is left intact throughout the entire transmission process. The 3370 Series is immune to pathological signals over the entire budget link and operating temperature range. Signals are equalized and re-clocked prior to fiber optic transmission and the 3371 receiver features a re-clocked SDI output. The 3370 model operates with one single mode fiber. DC to 115 Kb/sec, max.